The tenth chapter of the Gospel of St. Matthew underscores the cost and requirements of proclaiming Jesus’s message to the Church. “One’s enemies will be those of his own household,” is the stark reality Christ presents those of us who would preach that gospel message. Those passages have become prescient in light of the recent forced resignation of House Chaplain, Fr. Patrick Conroy, S.J., by House Speaker and self-proclaimed devout Catholic, Paul Ryan of Wisconsin. Only twice in its history has the House of Representatives employed Roman Catholics as chaplains, and Fr. Conroy is the first Chaplain of any denomination ever to be dismissed before the end of his tenure. The problem is that whatever scenario regarding the dismissal of Fr. Conroy proves true, it presents troubling issues for Roman Catholics and people of faith in general. Speaker Ryan has either jettisoned a chaplain for adhering to the recognized tenets of all major religions or caved in to thinly veiled anti-Catholicism. From the founding of the nation through the campaigns of Al Smith and John F. Kennedy, some members of our society have openly questioned the ability of Roman Catholics to function as “full and true Americans.” Roman Catholics of all stripes have proven their patriotism and devotion time and again either through military or public service. Those of us who know the history of the days when the Know-Nothings sparked fear throughout Catholic America shall remind Americans that there was nothing great about that time. If Fr. Conroy’s forced resignation came about because his prayers made some “uncomfortable”, then they should revisit our Nation’s history. In 1774 when there was discussion as to appoint a Chaplain to Congress, some representatives raised the issue that some may be “uncomfortable” if the minister was not of their denomination. This controversy was ended when Samuel Adams observed “He was no bigot and could hear a Prayer from a Gentleman of Piety and Virtue, who was at the same Time a Friend to his Country”. We would be wise to follow Sam Adams’ wisdom in an effort to make America great again. 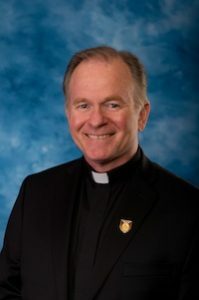 We, the Ancient Order of Hibernians, call upon Paul Ryan, Speaker of the House of Representatives, to give sufficient answer to the questions surrounding the dismissal of Reverend Patrick Conroy, S.J.